Warranty claims must be through an authorized Big Tow trailer dealer. The dealer must call our warranty department and they will be provided with a claim form. Prior authorization is required before any work can be performed. Failure to get prior authorization may result in denial of the claim. In order to better serve the dealer and the consumer, all warranty claims MUST HAVE a preauthorization number PRIOR to any warranty work being performed. If the work performed is not preauthorized with a claim number, the warranty claim may be deemed void. The dealer must call our warranty service department to receive an authorization number. Big Tow must also receive immediate notification of a defect in material or workmanship in order to expedite the warranty service. Also, defective parts must be returned within 30 days of receipt of replacement parts or you will be invoiced for those parts. Big Tow does not pre-authorize any dealership for warranty work. These procedures must be followed or the warranty will be null and void. If you have any questions about our warranty policy, please contact our warranty department. 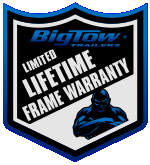 Call our warranty department at 320-593-4543.